The northern pike, Esox lucius, is not native to Utah, but it does have a holarctic distribution - it is native to many parts of northern North America, northern Europe, and northern Asia. 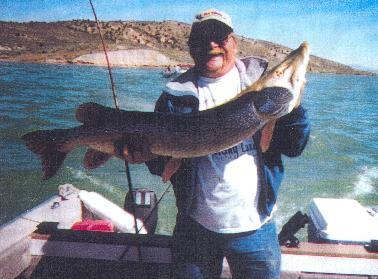 The northern pike has been introduced to several areas of Utah, including Lake Powell, Yuba Reservoir and Redmond Lake. Although not common in Utah, it is a popular sport fish for some anglers. Northern pike can grow extremely large in some parts of their range, but they usually do not get larger than three to four feet in length in Utah. Adults of the species are primarily piscivorous (they eat fish), but other animals, such as amphibians, rodents, and even birds are also consumed. Northern pike spawn in shallow water in the spring. No care is given to the eggs, which hatch in about two weeks. Northern pike prefer to live in lakes, where they seek out cool water. They have a long, torpedo-shaped body and can be caught using bass gear or musky lures. Catch & kill requirement at Utah Lake. At Utah Lake, all Northern Pike must be killed immediately and not released back into the water. The DWR also asks that you bring the fish to them (at the Utah Lake State Park in Provo if possible) and to record the location (GPS coordinates would be best).